Dr. Matthew John M. Krane is a Professor of Materials Engineering at Purdue University and a member of the Purdue Center for Metal Casting Research. His research is on design, development, and modeling of materials processes, particularly the solidification and thermal processing of metal alloys. Much of the work examines the formation and prevention of processing instigated defects and several projects have included the quantification of uncertainty propagation through the models. A numerical model of electroslag remelting of nickel superalloys has been developed to study macrosegregation, solidification behavior, and slag skin formation. It has been used to study the effects of ingot diameter, mushy zone permeability, process current levels, and initial composition. Composition variations are made within the standard ranges for alloy 625 to alter the solutal contribution to buoyancy-driven flows and macrosegregation. Average steady-state macrosegregation and radial composition distributions are compared to identify processing conditions that best ameliorate this defect. As expected, increasing the ingot size increases the overall segregation, especially at the centerline. Processing ingots with a low current and an initial composition in the low end of the specification range is the best choice to reduce macrosegregation. 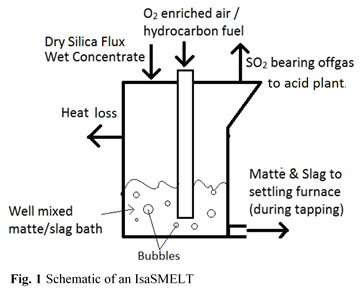 J. Yanke, K. Fezi, R. W. Trice, and M. J. M. Krane, “Simulation of slag skin formation in electroslag remelting using a volume-of-fluid method,” Numerical Heat Transfer, Part A: Applications, 67, pp. 268-292 (2015). 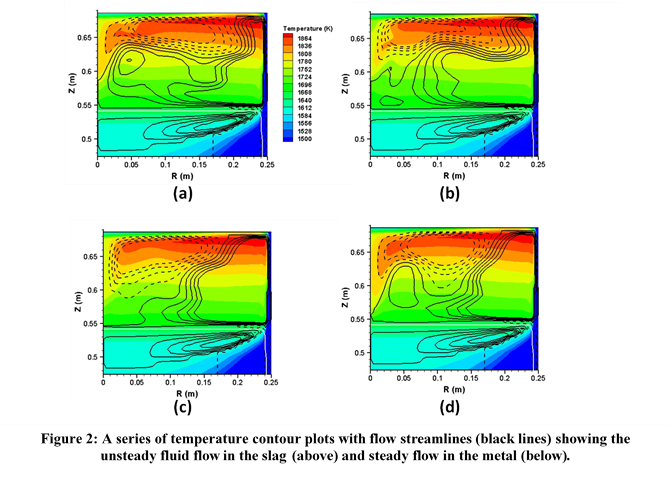 A. Plotkowski and M. J. M. Krane, “The use of inverse heat conduction models for estimation of transient surface heat flux in electroslag remelting,” ASME Journal of Heat Transfer, 137(3), (2015). K. Fezi, J. Yanke, and M. J. M. Krane, “Modeling macrosegregation during electroslag remelting of alloy 625,” Metallurgical and Materials Transactions B, 46B, pp. 766-779 (2015). 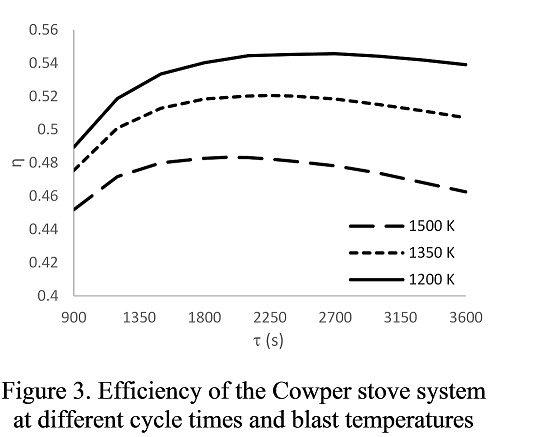 J. Yanke, K. Fezi, M. Fahrmann, M. J. M. Krane, “Predicting Melting Behavior of Industrial Electroslag Remelting Ingots,” in Proceedings of the 2013 International Symposium on Liquid Metal Processing and Casting, M. J. M. Krane, A. Jardy, R. Williamson, and J. Beaman (eds. ), pp. 47-55 (2013). M. J. M. Krane, M. Fahrmann, J. Yanke, E. Escobar de Obaldia, K. Fezi, and J. Busch, “A comparison of predictions of transport phenomena in electroslag remelting to industrial data,” in Proceedings of the 2011 International Symposium on Liquid Metal Processing and Casting, M. J. M. Krane, R. Williamson, J.-P. Bellot, and A. Jardy (eds. ), pp. 65-72 (2011). 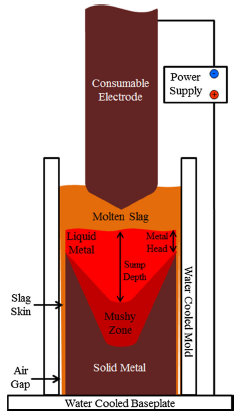 The solid structure and thermophysical properties of three electroslag remelting (ESR) slags were characterized. Samples from ESR trials performed by Special Metals Corporation were compared to samples solidified in a vacuum induction melter (VIM) at Purdue. The structures were characterized using a combination of optical, SEM, XRD, EDS, and serial sectioning to quantify porosity. Thermophysical properties were measured using DSC and laser flash. The two processing routes were found to produce similar phase fractions, but resulted in different properties as a function of phase morphology and porosity content. These results suggest that future modelling and property measurement efforts must account for both the structure and composition of the slags. A. Plotkowski, J. deBarbadillo, and M. J. M. Krane, “Characterization of the structure and thermophysical properties of solid ESR slags,” Materials Science and Technology, 32, pp. 1249-1263 (2016). 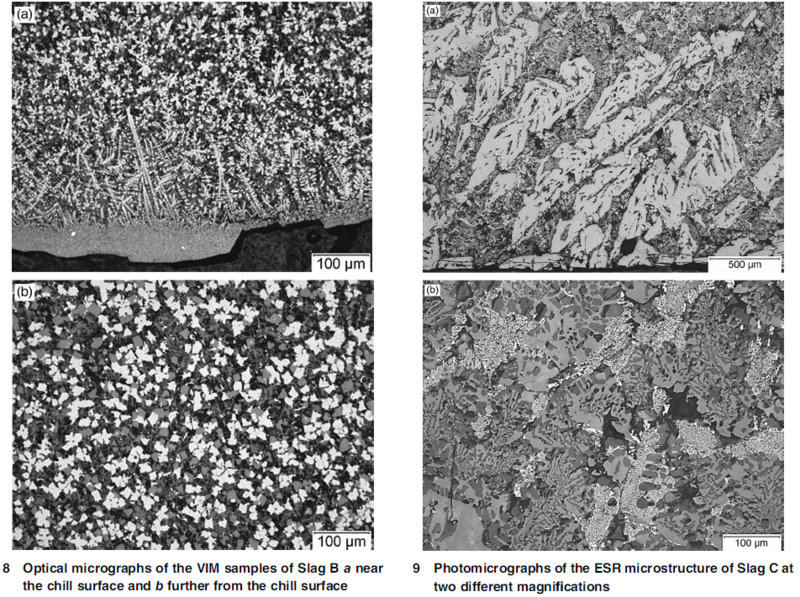 A. Plotkowski, J. J. deBarbadillo, M. J. M. Krane, “Characterization of structure and thermophysical properties of three ESR slags,” in Proceedings of the 2015 International Symposium on Liquid Metal Processing and Casting, A. Karicha et al (eds) (2015). 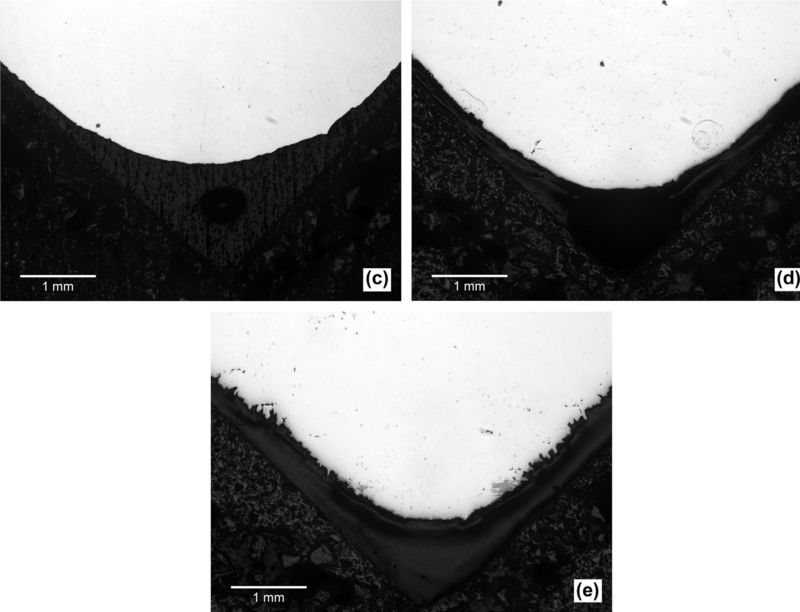 J. Busch, J. deBarbadillo, and M. J. M. Krane "Flux entrapment and titanium nitride defects in electroslag remelting of Incoloy alloys 800 and 825," Metallurgical and Materials Transactions A, 44A, pp. 5295-5303 (2013). Direct chill (DC) casting is widely used to produce ingots of wrought aluminum, copper, zinc, and magnesium alloys. The ingot quality directly influences the properties of the final products used in various applications. One measure of product quality is ingot scale chemical inhomogeneity, commonly called macrosegregation, which is problematic because it complicates subsequent heat treatment and deformation processing through nonuniform microstructure and mechanical properties in the final product. The commonly observed steady-state radial segregation pattern for DC cast, grain-refined ingots consists of a solute-enriched surface, depleted subsurface, slightly enriched mid-radius, and strongly depleted centerline. Numerical process modeling has been a very useful tool to gain insight into the fundamental transport phenomena that cause this radial segregation pattern in steady-state DC casting. Vacuum arc remelting (VAR) is a secondary melting process for production of metal ingots with elevated chemical and mechanical homogeneity for highly demanding applications. The ingots from VAR process are typically used as a material for critical parts of jet engines and industrial gas turbines as well as in military applications and heavy industry. The specific of such applications often demands outstanding material properties. The common examples of such materials are Ni superalloys, Ti alloys, and highly alloyed steels Metal is formed initially in the shape of cylindrical electrode, which is melted by the heat of a direct current electric arc into water cooled copper crucible, where solidifying forms the final ingot. The electrode is shifted downward as it is melting to maintain constant arc length. A strong electromagnetic body force is induced within the solidifying ingot due to the curved path and non-uniform distribution of the electric current. 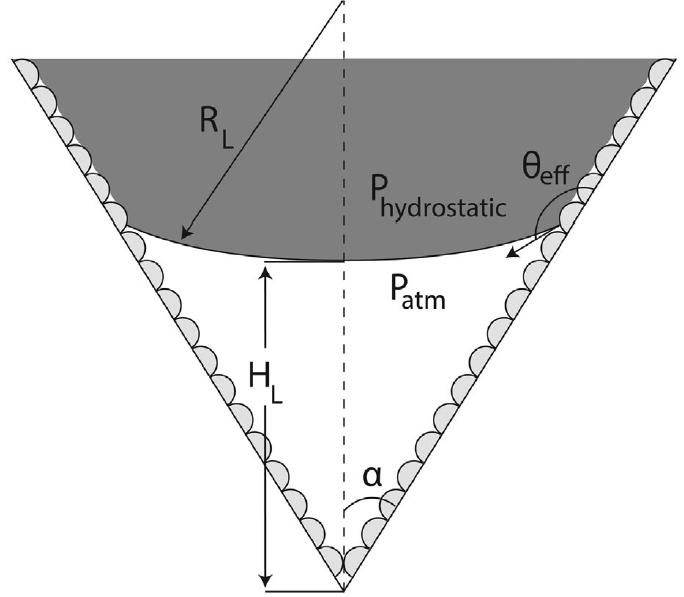 D. Zagrebelnyy and M. J. M. Krane, “Segregation development in multiple melt vacuum arc remelting,” Metallurgical and Materials Transactions B., 40B, pp. 281-288 (2009). When casting products which depend on fine features for their function, the ability for the liquid metal to completely fill those mold features is very important. By better understanding the factors that affect the filling of molds and improving the ability for the liquid metal to fill the mold, the production of quality castings can be improved. One example of this challenge is the investment casting of single crystal superalloy turbine blades in ceramic molds. Most liquid metals are non-wetting, having a contact angle greater than 90° on common ceramic mold materials, meaning the amount of pressure required to force the liquid metal into a fine feature increases as the size of the feature decreases. As features become smaller, the required pressure increases until it is larger than the available hydrostatic head, preventing complete filling of the feature. The same is true of sharp corners and edges, with the applied pressure being insufficient to force a non-wetting liquid into the bottom of the corners. This incomplete filling results in the metal corners being unintentionally rounded, which can require additional machining to achieve the desired shape. Invited: L. Kroneman, M. J. M. Krane, and K. P. Trumble, “Wetting behavior of CMSX-4 in V-shaped channels for investment casting of fine features, International Journal of Cast Metal Research, 29, pp. 317-329 (2016). L. Kroneman, M. J. M. Krane, K. P. Trumble, “Wettability and penetration of CMSX-4 in sharp corners for use in investment casting of turbine blades,” in 6th International Symposium on Shape Casting, 2016 TMS Annual Meeting, TMS (2016). S. Zhang, D. R. Johnson, and M. J.M. Krane, “Effects of Geometric Constraint on Phase Selection and Segregation in Cast TiAl,” Mater. Res. Soc. Symp. Proc., v.1295, pp. 183-188, MRS (2011). R. Shao, K. Trumble, M. J. M. Krane, "Effects of Geometric Constraints on Alloy Solidification in Metal-Matrix Composites,” Modeling of Casting, Welding and Advanced Solidification Processes - XII, S. Cockcroft et al (eds. ), pp. 495-503, TMS (2009). R. Shao, K. P. Trumble, and M. J. M. Krane, “Infiltration and directional solidification of CMSX-4 through a particulate ceramic preform,” Metallurgical and Materials Transactions A, 36A, pp. 2461-2469 (2005). Numerical models of alloy solidification have been developed and used to predict a variety of defects in a variety of solidification processes. Some of the well-established physics incorporated into these models include diffusion and advection of heat, mass, and momentum and solidification thermodynamics. Insight into solidification processes can be gained through the use of these models that would be not be possible through laboratory experiments. However, the predictions made by these models are typically reported with arbitrary precision without regard for the uncertainty inherent in the numerical methods, the choice of model, or the values for properties or boundary conditions. This lack of knowledge of uncertainty propagation in solidification simulations can pose difficulties in using these models for process design. Understanding the effect of uncertain input parameters and quantifying their effect on the prediction uncertainty allows better calculations of margins of safety and improved estimates of reliability of the process. Also, when there is an apparent mismatch between experimental data (ideally with quantified probable variation) and predictions (which appear to have none), there is often an impulse to seek better agreement by improving existing or incorporating new physics in solidification models, without considering the kind of uncertainty that exists in a given numerical model. This approach ignores the actual uncertainty in the numerical results, which are required to find the probability that there is agreement with experiments. Model assumptions and probable input variability create a level of uncertainty in model predictions that has not been calculated in solidification modeling until recently. A. Plotkowski and M. J. M. Krane, “The sensitivity of an electroslag remelting model to uncertain slag properties,” in Proceedings of the 2017 International Symposium on Liquid Metal Processing and Casting, M. J. M. Krane and M. Ward (eds) (2017). K. Fezi and M.J.M. Krane, “Uncertainty Quantification in modeling equiaxed alloy solidification,” International Journal of Cast Metal Research, 30, pp. 34-49 (2017). A. Plotkowski and M.J.M. Krane, “Quantification of epistemic uncertainty in grain attachment models for equiaxed solidification,” Metallurgical and Materials Transactions B, 48B, pp. 1636-1651 (2017). K. Fezi and M. J.M. Krane, “Uncertainty Quantification in modeling metal alloy solidification,” ASME Journal of Heat Transfer, 139, pp. 082301/1 – 082301/12 (2017). K. Fezi and M. J. M. Krane, “Uncertainty quantification in numerical modeling of DC casting,” in Light Metals 2016, 2016 TMS Annual Meeting, TMS (2016). Invited Keynote Lecture: K. Fezi, M. J. M. Krane, "Uncertainty quantification in solidification modeling," in Modeling of Casting, Welding and Advanced Solidification Processes - XIV, H. Yasuda et al (eds.) IOP (2015). Energy is a large part of the cost of the pyrometallurgical metal extraction. One metric for the analyzing and improving the performance of such energy intensive systems is the use of exergy analysis. Exergy is the part of an energy stream that produce useful work and so it is therefore the part of that stream with economic value; it can be stored in thermal, mechanical, and/or chemical form. While energy is conserved when transferred (as thermal energy in a heat exchanger) or used in any way (say, turning electricity into heat), it is degraded in usefulness and so exergy is destroyed and not conserved during real processes. Exergy destruction minimization has been used successfully for the purpose of optimizing design parameters and plant configurations in a variety of energy-intensive systems. Moreover, this type of analysis has been used to attach financial cost and environmental impacts to exergy destruction to optimize systems with respect to economic and environmental objectives. what is the minimum work needed to give the stream the exergy values it has? what is the maximum work could we recover if we let the stream interact with the environment? how different is the process stream from the environment? P. E. Krane and M. J. M. Krane, “An exergy study of Cowper stove operations with an iron blast furnace,” paper accepted for presentation at symposium on “Energy Technologies and CO2 Management,” 2018 TMS Annual Meeting, TMS (3/18). P. Mather and M. J. M. Krane, “Irreversibilities in the smelting of copper,” paper accepted for presentation at symposium on “9th International Symposium on High Temperature Metallurgical Processing,” 2018 TMS Annual Meeting, TMS (3/18). R. J. Krane and M. J. M. Krane, “The optimum design of stratified thermal energy storage systems,” ASME Journal Energy Resources Technology, 114, pp. 197-208 (1992).